A couple of times during my life, circumstances have forced me to accept quite atypical work off the beaten path of success for my career plan. The first time was in the late '60s, following a devastating (for me) divorce, when I became a glorified attendant of some sort in a private psychiatric hospital outside New York. The second time was more recent, after we'd moved to Ohio and I took a bureaucratic job with the Social Security Administration. Both jobs involved receiving considerable hostility from the people I was supposed to serve. But I think of those times fondly because I learned so much. For one thing, I discovered people who have such jobs are real human beings, like you and me. Most often they turn out to be terrific folks who confront the pressures of every day, looking into the eyes of a public that hasn't the slightest personal interest in them. Bureaucrats particularly are despised as stupid, careless, faceless clods for whom sadistic regulations carry biblical weight. I remember Speaker of the House Newt Gingrich a few years ago lecturing the Congress and the American people savagely about getting rid of government bureaucrats. His Republican Party continues bent, it seems, on destroying the livelihoods of all social service workers. Well it's true, sometimes you've stood in line or sat in a waiting room for a couple hours, and when you finally get to that lifeless form behind the counter or the desk, you forget the person has been deluged with all these people during the same amount of time. And the machines aren't working, and the regulations have been made up by people who just want to prove to their superiors that they're doing something with their time, and what you have are 2 people facing each other ready to fly out of their skins. I can't tell you how many times my work experiences have helped me through a process like that. And that was the case yesterday. Late Wednesday afternoon I was given a diagnosis of prostate cancer. Early Thursday my doctor's office phoned with an appointment for a total body bone scan at a small, local hospital that I like, which shall be nameless for the purpose of this Internet article. The most insidious activity this kind of cancer does is spread to the spine, just outside the pelvis, and from there throughout the bones. It also heads for the lymph nodes, but this test isn't for that. A bone scan is routine and necessary to decide the next step. So the appointment was for yesterday, and would take 4 or 5 hours and I was supposed to drink gallons of water during the day and night in between. I would be injected with an amount of radioactive substance into my bloodstream. The substance would circulate through my body and be absorbed by my bones. 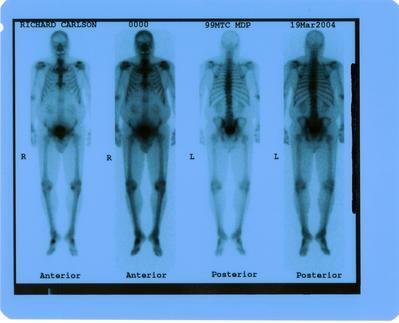 A nuclear medicine body-imaging camera then would scan me for abnormalities. I needn't tell you I was a little on edge when I got there. One of the reasons I like this small hospital is because of its friendly atmosphere, but the cheerfulness of the woman who checked me in couldn't lighten me tremendously...though it helped. The lady at X-ray was an ancient who must have worked there since they laid the cornerstone. Her little office was lined with folders containing every X-ray taken in the last 5 years. She was shredding documents...and I cracked my first joke of the day. It didn't get a big laugh. Then I was introduced to Sue, which is not her real name. She would be my technician, and she led me to a cluttered room, for which she apologized, and laid out little lead-lined containers. Sue was light and quick and very cheerful, maybe in her early 30s. The needle went in perfectly, so that I barely felt it, and I said so. Some blood was extracted, which went into the containers, and then the mixture was injected. She asked me what this was for, and I told her, which slowed and darkened her a bit. She told me to do whatever I want for 3 hours, but to keep drinking. I asked if whiskey would be all right, and she answered, "As long as you can get up on a table and not fall off." We had established a pretty good working relationship I thought. Three hours later we met again, this time in the nuclear medicine room. The scan costs $2000 and there must be a half millon dollars worth of equipment in that room. Sue was quiet and serious now, but still moving quickly...and I was nervous as hell. There were no noticeable side effects from whatever was inside me, though I wondered if my pee would glow in the dark. I was going to have to lay motionless on this table platform for 35 minutes, while the machine slowly moved around me from top to bottom and then back up. She made adjustments, checked 3 different computers, moved me a little, and then we started. For 20 minutes not a word was spoken, and I kind of meditated/dozed while the huge machine did its thing. I thought Sue had left, but suddenly she was beside me---and I jumped. She apologized but said she was afraid the camera was going to hit my feet. She pushed a button, and then asked me to raise my knees a little. I said, "I only wear size 9 1/2. My feet can't be that big." She acknowledged that, and then started to rush around the room...clicking keyboards and pushing this button and that. She said those words you hate to hear: "The machine never has done this before." I sighed. Must be this girl's first time on her own, and that's what I get for coming to a small hospital. Here I am full of radioactivity...and probably I can't take this test again for a while. I suggested that I drive to another hospital right away while I'm still hot and glowing. She said no, that she'd get it...but we have to start over. I took off my shoes. Sue said she had clicked Pause, to move my feet, but that the computer now was requiring her to begin a new scan rather than continue. It was a glitch. She said she would do this one manually. She seemed to know what she was doing. I asked if she was a nurse or an X-ray technician or what. She answered gently that she ran the department. Then she told me how that came about. The machine started again, and I lay there. She'd been doing this at the hospital for 12 years, fresh out of wherever you learn to do this stuff. The first 2 years she had 2 different bosses. Then they asked her to take over. She gave it a try (she has 7 kids at home) and became frustrated when the other techs (a union shop) insisted on being asked to take an extra shift, rather than follow orders. She ended up taking the shifts herself because they usually said no. She thanked the administration for the opportunity to direct the department, but asserted she preferred her old job back. Her superiors replied that they hated to see her go. In other words, she would continue in administration or lose her job. So there she's been, working day and night, commuting 45 minutes each way, and taking care of 7 children (4 of them adopted) and her husband. Her youngest biological child is 9, but at some point they licensed as a foster home. Sue is the eldest in a family of 11 children, so she wanted a large family too. They were looking to adopt another little girl. The first kid they got was a boy, aged 12. They were doing weekend respite care, but on the 3rd visit the boy pleaded to stay. Children Services reminded them the boy was up for adoption, and Sue and her husband agreed to it. Soon it turned out Bob (not his real name) had a younger brother and sister also in foster care...and they started coming on weekends. So what could they do? Most recently, Children Services (really good foster homes DO seem to be a rare thing) sent them a little girl who had been slapped around in foster care. And they adoped her. Sue said her main worry is that her biological children aren't getting all the attention they should have...and so sometimes she feels guilty. By now the camera was coming back up towards my head, and I knew my time for talking was growing short. We just couldn't do this whole thing again. I was impressed with the dutiful beauty of this person with whom I'd spent more than an hour. I told her so, and said I worried only if there was too much stress in her life. She laughed, and said it keeps her going and that's a good thing. The picture was done, and she sat down to view the screen. I sat on the floor and put on my shoes. She was looking at my pictures. I didn't want to take advantage of the situation, and I knew she wasn't qualified as a radiologist, who will look at the pictures on Monday, or to tell me about it, which my doctor will do next Wednesday. She said, "Would you like a copy of this?" Despite my immense anxiety, I answered yes at once. I said, "I broke my ankle once." (Breaks and arthritis show up besides cancer growth.) She said, "Which one?" I moved both my feet, going blank for a minute. "My right I think." "There it is," she said. And we looked together at the screen. "It looks great to me," Sue said...and clicked Print twice. I don't know if Sue broke any rules commenting like that and giving me a copy, and I didn't ask. We were busy now looking at photos of her whole family which she had up on the wall. They look happy. And even though I know a more trained eye may find something I'm going to have to attend to in those pictures you see up at the top of this article, I felt relieved. Besides my own personal health issues, I had experienced again the basic goodness of another human being. Sue is a technician, a bureaucrat, a technocrat---and that whole procedure could have come and gone without the slightest interaction. As we parted and hoped we meet again someday---"under other circumstances"---Sue said, "Looky-here, I've told you the whole story of my life." And I said, "It's been an honor to meet you." And so I had to tell you too. Thanks for Sharing, Richard, I feel that it´s important, for you and for us. 20 Mar 2004 @ 05:41 by jazzolog : What Fragrance! I didn't know about that. I love them, and alas it is too cold in Ohio to grow any outdoors. I wonder whether you remember your cherry tree, which we planted in our herb garden last year. It looks ready to bud soon. We may not get blossoms yet this year....but I'll post a picture here at just the right moment so you can see. Human, down to earth interactions with others is what makes life during the tough times bareable. I am so very proud of you and for sharing this special moment in your life with us and with me in particular. Thanks for the many years of frienship and here my dear(Lifing my glass-of OJ) is to many more. I beat my cancer and if it is possible for one to do it then two can do it. Wayne is the number two and so you can make it three winners. Being activly involved is an expression of that inner Authority that you have. It helps move the healing process forward. Way to go my friend. ...an I told you more than 5 years ago that you are an awesome writer. Limits are necessary to give purpose and direction to life. Swimming in a sea of boundless opportunity would soon lead to exhaustion. Winging it alone in a sky of boundless opportunity would lead to being lost. In human affairs, the making of choices, and alliances, implies limitation, for in choosing one path another must be abandoned. One key to a successful life is to select your limits consciously and carefully - to be discriminating in the setting of personal boundaries and knowing when to join in formation. Thrift, for example, often precedes prosperity; just as the letting go of selfish interests often leads to greater personal reward. Only by consciously accepting useful limits can one's energy be channeled to good purpose, and lead to lasting accomplishment. Point yourself toward a middle way, the mean between discipline and freedom of spirit. Limits will come of their own accord; but to be able to consciously select your own affiliations in life - that's knowing how to fly! At the same time, do not go overboard on discipline. Even limitation must be limited, so that in attempting to bring order and direction into your life you do not choke off vital sources of enthusiasm and spontaneity. Similarly, in groups and organizations, the rules and regulations should strike a balance between being too strict and too soft. If too strict, they build frustration among people, and ultimately become destructive. If too lenient, sloppiness becomes acceptable, and energy is soon dissipated. The best path is one which allows for the fulfillment of individual potential, while encouraging self-discipline and focus. Nellie is a friend and neighbor here in Athens, where we met working on children's theatre. Hoping and praying your recovery will be speedy. I especially enjoyed hearing about the appointment meeting. If we all could interact with such grace the world would be a better place. I love this essay, it is so real and alive with the human spirit in you and in Sue. It is that spirit that pulls us through at times like this. Thank you for you openness and honesty. Elyse is a dear friend of 30 years and former colleague during teaching days in Massachusetts. One day I suggested she should move to Manhattan---and sort of dared her to. To my astonishment she did it and has lived in the same apartment, near Columbia, for a quarter century. They say that cancer cells are surrounded by inflammation and that the cancer feeds off this. Energized water will neutralize the free radicals that make up inflammation and should help with the cancer. It's something to keep in mind if the radiation doesn't work and it's well worth a try. Thanks for the tip Pat, and nice to meet you. She IS a member, in case you clicked her name and thought jazzoLOG had been spammed. Our water still comes from our own well...and I complement it with regular trips to a spring in Zaleski Woods. That's mostly for our special-occasion drinking water, which is so energized naturally it just jumps up and says Howdy every time I drink some. Usually this time of year we find salamander fry swimming around in it in my glass gallon jugs. I don't know if wiring it would improve on the energy or not...but will think on't. We're tending away from radiation as our option. That leaves the surgery...and I'll have a couple months probably to prepare and deal with the fear. Alternative methods will be added too...although we already have a pretty healthy lifestyle. 24 Mar 2004 @ 18:00 by Pat Beatty @209.52.173.51 : Have you tested your water? It could be that your spring water is charged, have you tested it? I heard from a fellow in Buxton (N.Eng.) where they have a spa and he said that that water is energized. It's a fascinating subject. Today I sent you an email and then began to enjoy your marvelous network of faceless friends all out here connecting to you and your quest. Know we are connected and after reading little snippets of nurturing I am blessed for knowing you. Grange made me a tape recently of some piano jazz by her late husband Al Haig. She went so far as to plug in a microphone and introduce a few of the selections. Let me tell you that she has the penultimate female jazz speaking voice. The thought of her singing to me---maybe Fly Me To The Moon?---puts this cat in a trance. 26 Mar 2004 @ 06:24 by Grange @152.163.252.200 : New York City Sends Kudos to RIchard! Honest! NEW YORK IS WAITING FOR ME TO SHOUT FROM THE TOP OF A RED DOUBLE DECKER BUS IN LESS THAN TWO HOURS...10:00 A. M. LISTEN! Are we straying way off topic here...or is this getting down to the bare bones? Lady outdoes herself to show the trait of jazz fans and players (particularly when they interpolate) to run circles around each other's heads with obscure reference. Outsiders (who used to be called squares---and not able to run in circles at all) have no idea what we're talking about---and jazzers, for some reason, like it that way. Look at all the terms we've made up---like the word "jazz" itself, for instance. "TNT" is a big band arrangement from 1955 or so, that'll make your socks roll up and down---if you're into that sort of music. The only recording I know of was for the Fantasy label and featured both Al Cohn and Zoot Sims on tenors. For some strange reason it's true that Elliot Lawrence had an orchestra at that time, with those and other luminaries in it, that played not only Tiny Kahn original compositions but also those of Gerry Mulligan, Johnny Mandel and Cohn himself. You really couldn't do better than that---and yet of course the band remained unknown, failed, and disappeared. If anyone remembers Lawrence at all, it was as a Broadway pitband leader. What Grange doesn't know is that I saw him once, in Jamestown NY, fronting the Johnny Richards band of the late '50s, with both Gene Quill and Phil Woods on altos, performing that band's entire book. And yes, they played "The Ballad of Tappan Zee." As for Tiny Kahn, who is hardly remembered as an arranger by anyone at all including jazz fans, he was a musician who pioneered the Mel Lewis approach to big band drumming, and unfortunately died much too soon (he was 29)---as is the case with so many jazz artists of that time. There is a connection to Al Haig, in that Tiny was the drummer for the celebrated Storyville sessions of Stan Getz and Jimmy Raney in 1951, in which Al played piano. One of the evenings was recorded (in 2 volumes) and surprisingly always has been available for purchase. If your appetite is whetted, Stan Getz At Storyville is a wonderful place to start (on a Roulette CD in the States). 27 Mar 2004 @ 16:44 by Lady Haig @152.163.252.199 : Richard, of course a BAND IS COMING! Now then, business Richard, what did the doctor say to you today? Does he like your attitude? Certainly your pensive smile. Tell me. Well Grange, he said, "Not very much but you are extra special. "Good Richard, he is going to give you a little party tonight." "I don't know Grange, he seemed extremely concerned about my upcoming surgery." "Never mind Richard, when he comes to the house with Red Rodney, Allen Eager, Serge Chaloff, Al Haig, Chubby Jackson, Tiny Kahn, Al Cohn and Gerry Mulligan it is to allow you to go into ELEVATION and connect to feeling FINE AND DANDY. Certainly THE GOOF AND I want to get the message through to you that ALL GOD's CHILLUN GOT RHYTHM. So know that you can love, laugh and dance right upto surgery because you are YOUNG AT BOP! I've got my arms out, Dana, may I have this dance? You're on your own with all those references this time, jazz fans. If that group is jamming in the waiting room, this operation will be a groove! Surely Symphony Sid will be announcing the tunes?